Within the walled enclosure of Monte Real protected by the sea and flanked by a pine wood, this Parador rises up in a priviledge location. Regal drawing rooms with decorative features from other ages form a distinguished interior in which the spectacular stone staircase of the entrance hall stands out. Located in a historic building that retains its imposing facade. Now completely renovated inside-the design of each of the spaces marked by lines fused with classical and oriental art avant-garde, resulting in a framework of eclectic elegance unmatched. Nagari Health & Spa is a true health and beauty sanctuary located in the heart of Vigo, with 2 floors for serenity, harmony and well being of body and mind. Set in exotic Asia, each piece has been carefully selected for your body and mind to enjoy the luxury and comfort. With 750 m2 distributed between the 1st floor and attic, in this magical place you will find the Skyline swimming pool with pools and sea views, a personal training center platforms Power Plate, a complete circuit of saunas, solarium, cabins of beauty treatments or a tub of sensory stimulation exclusive “The Sieste” in a special and unique in the world to experience an indescribable feeling of weightlessness. Without any doubt, Nagari Skyline is the most exclusive and impressive component of the Hotel. It is located on the top floor of the building, almost makes the customer “touch the sky” while enjoying a pleasant naturalized water circuit. It has cervical jets, swan necks, volcanoes that rise from the bottom, bubble beds that work the entire back of the body and cross-current jets. Besides, this fantastic circuit has two heated Jacuzzis one covered and one uncovered, and a solarium. The cover is telescopic, opens or closes in a few seconds depending on weather conditions. Other amenities include a cafeteria available to customers while enjoying the circuit. At night, the pool becomes a modern Skyline terrace bar, offering a new perspective of the city. As intimate, in Skyline Bar you can enjoy the best cocktails accompanied by an exclusive selection of chill out music. The breathtaking views over the Ria de Vigo complete the picture. This lounge bar is open to the public of the city. It is also available to surprise your guests if you arrange an exclusive private party. Discover the flavors of our restaurant. Modern and elegant, every detail of Alameda Restaurant has been carefully chosen XXI to create a warm and cosy, experience in a great location for successful staging of a high quality service. Its Menu brings together tradition and innovation, allowing you to convert the pleasure of eating experiences in the discovery of pure, authentic recipes through the unmatched quality ingredients. Alameda Restaurant XXI is constantly being updated through its Culinary Calendar which will taste the best dishes exploiting the raw materials of each season. The flavors, aromas and textures of its dishes are accompanied by an extensive wine and spirits with more than 200 national and international references. It also has an outdoor terrace. It is also a space provided for artisans to taste delicious food based on high quality products for customers who prefer a more casual meal. In its menu you will find different tapas and kebabs, which are varied and tasty authentic culinary masterpieces in miniature. It also has large terrace at the Mall of Vigo. BUSINESS AREA, ideal as a workplace for informal meetings and individual presentations. GOLD MASTER SUITE MEETING ROOM : The most private and exclusive meeting on the 7th floor of the Hotel. SKYLINE: Located on the top of the building with wonderful views of the Cies Islands, where you will arrange original events in a single place. The exclusivity of our facilities with cutting-edge designs and the customization of every service make the Hotel a unique place to celebrate your event. Composed of two larger rooms, Gold Master Suite hall, reserved Corners in Alameda XXI Restaurant, Business Area and the top of the Hotel, with wonderful views to the “Ria de Vigo”, our exclusive Skyline Terrace for your unforgettable event. Every detail in our hotel has been prepared to make your event an unforgettable experience. We offer a wide variety of services, which have been created exclusively for gastronomic enjoyment, led by the prestigious Executive chef Bernardo Esperante. Meeting room with capacity for 60 people, equipped with electronical devices and catering service. Meeting room with capacity for 32 people, equipped with electronical devices and catering service. Located in the historical centre of town, this Parador is an old Renaissance palace dating from the 16th century which was formerly the residence of the Counts of Maceda. Distinguished, stately and noble describe the interior which boasts regal staircases, antiques and illustrious furniture. The carved stone staircase leads the way to the welcoming, comfortable bedrooms. The dining room has an aristocratic appearance completing the harmony of the common areas decorated with mirrors, paintings and candelabras. As is usual in the paradors, the menu concentrates on the regional cooking. There are however international dishes and a special gluten free suggestions. Located in a pedestrian zone in the oldest part of Pontevedra, walking is essential for sightseeing the porticos and the many little palaces in the town. The Parador is located in the old quarter of the town, right in the heart of the Rías Baixas. Pontevedra is linked by motorway to the main provincial capitals of Galicia. It is 23 km from Vigo, 55 from Santiago de Compostela and 120 km from A Coruña. Upon reaching Pontevedra from the A-9 motorway, the best exit to take is `Pontevedra Norte`. Then follow the signs towards `Puente de Burgo` (the only approach road to the Parador), and after passing a roundabout, you will come to a pedestrian street that leads to the Parador. Set in a landscape of great natural beauty, Torre do Rio is surrounded by the river Umia, this traditional rural hotel boasts lots of charm. Set in a landscape of great natural beauty, surrounded by the river Umia, this traditional rural hotel boasts lots of charm. Relax in the spacious, light and tastefully decorated rooms. You can also take a stroll through the gardens of the estate and the surrounding countryside. Torre do Río is a restored textile complex dating from the 18th century, bathed by a meander of the Umia River, surrounded by nature in the purest Galician style. Everything seems conceived for experiencing the tranquillity and harmony of an almost magical setting. The house also has a spacious living room with a fireplace where you can take refuge and enjoy a good book, a coffee or maybe a good conversation. Natural pool with waterfall, located in a unique environment that will make the guest feel as if they were taking a bath in the river itself. Wooden bridge, gazebo and terraces to enjoy the river or savor a coffee or a snack. Nature, design, personalized attention with the flow of water as a soundtrack. You’re going to be walking on the beautiful Portuguese Coastal Way tackling the last 150 km of it from Oia to Santiago de Compostela. As well as enjoying beautiful coastal and typical Galician countryside scenery you’ll be samping the local gastronomy with an experienced, locally based English speaking camino and food guide. Discover the wild Atlantic coast and its beaches and the Rias Baixas estuaries along with the seafood and local wine from the region.Stay in pretty coastal fishing resorts and beautiful country retreats and expect to be spoilt on your adventure. You luggage will be transported between hotels and you will have your own chauffeur on call for you in case you need transport back to the hotel. Some of the highlights include at the start where we commence the camino from Oia Monastery where Sir Thomas Becket stayed in 1167. You’ll get a special tour of the monastery from the inside (as its closed to the general public). The first stage of the walk which follows the stunning coastline takes you to Baiona where the mayor will be waiting to offer an official welcome. In the evening your experienced and passionate guide will take you on his favourite tapas tour. The following day involves more walking along the coast passing golden sandy beaches before arriving in the city of Vigo where you will visit its Sea Museum. After another beautiful days walk through dense woodland and cascading mini waterfalls following Vigo estuary you will get to Redondela where the camino joins the main central Portuguese Way whee you will meet a lot more pilgrims who’ve travelled from Lisbon or Porto. When you get to the beautiful city of Pontevedra with the most impressive Old Town in Galicia after Santiago you’re in for another treat tasting the local shellfish with a local fisherman and seafood restaurant owner who will even take you to the local market to help you select your lunch! Then after another nice walk between vines you will get to Caldas de Rei where you will be staying in a beautiful old manor house in extensive grounds. You will have time to go for a bathe in the local thermal waters. After passing Padron you’ll be in for one of the highlights of your trip a special guided visit of Pazo de Faramello with the owner, Gonzalo, of one of the most important Manor Houses in the whole of Galicia. The final stage of your walk sees you get to the majestic UNESCO hertiatge site Santiago de Compostela Cathedral and its square where your walk finishes. Steep yourself in its history and visit the remains of Saint James in the crypt and celebrate your achievement as have your fellow pilgrims since medieval times. It will be an unforgettable experience you will forever cherish. You will be picked up today from Porto Airport, Train Station or hotel by our English-Speaking Chauffeur. 09:00AM: Our Camino Guide and Chauffeur will meet you at your hotel this morning. You will be given a daily walking schedule by our guide and your Pilgrims Credentials. Then you will walk the coast route depending on how much you want to walk you could do 18kms approx. and there is a choice at one point to go along the bike path to Baiona or over a hill range through a trail which spectacular views and through the village of Baredo. The 2nd option is a bit more up hill but better views. For lunch during the day our guide will recommended the best stop for lunch along the way. Upon arrival to Baiona you will stop to learn a bit about the discover of America, when La Pinta arrived near the Playa de America. Since our guide has done a lot to promote Baiona and the Coastal Camino way, the Mayor of the town would like to meet and welcome you to Baiona, and would like to give you each a gift to remember your trip. 07:30PM: Then our Camino Specialist Guide who is also a local food expert will meet you and take you on a food tour of the old quarter of Baiona for Dinner visit 2 or 3 spots for local food, plus will explain to you what you will do over the next days on the Camino Portuguese along the coast. You will start today walking along the bay area of Baiona toward the Playa de America and our guide will take you a picturesque part of the trail. Today it will be about 16kms of walking again since you will have the chauffeur-minivan at your disposition for the 8hrs during the day you could stop at any time if needed. Tonight we can book you a table at a recommended restaurant traditional cuisine. For the Foodies that would like to get a taste of Vigo you could do our tapas tour of the old quarter of Vigo. You could even take a hands-on cooking class with a Galician Chef and learn the secrets of the Coastal Gastronomy of the area. Table reservation for dinner tonight at the Michelin-starred restaurant Maruja Limon. Today you will be transferred to the starting point of the walk today and follow along the way to Redondela. Lunch will be special as we will visit the local market to buy nice fresh, locally caught fish/shellfish with the owner of O Bioco restaurant where we will go after to enjoy it! Drop off at hotel in Pontevedra. Dinner on your own. If not in the old quarter there are many options for dinning. Free time for lunch during the day your guide will recommended a spot to eat. Caldas de Rei is famed for its mineral water and there are a couple of Spas. After check in to a quaint manor house 1km from the village centre, you could go to one of the Spas to enjoy the mineral waters after your day of walking. You will enjoy a visit with the owner of the Manor house to get the idea of what a noble Galician Manor is like, one of the very best in all of Galicia. Lunch will be in a traditional restaurant nearby Manor house. Final Goodbye from your Camino guide today. Then walk to market Plaza de Abastos and take a look around. (D) 4 Dinners one based on tapas and wines in Baiona and then another 3 with traditional local cuisine at the manor houses. (L) 2 Lunches based on local traditional cuisine with wines included. Transportation in fully-equipped vehicle which changes depending on group size (See Transportation section) for transfer from Porto to Baiona and support for 8hrs per day for the Camino until Santiago on Day 9. Your luggage will travel in the minivan from accommodation to accommodation. 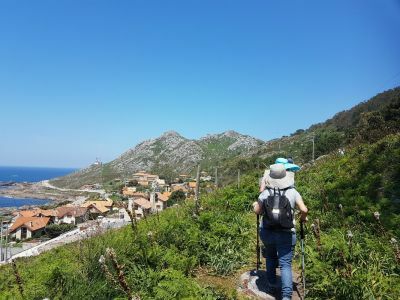 8 Days with English-Speaking Camino & Food Guide who has walked the Caminos many times and lives in Baiona. As well will guide the tapas tour on the arrival day to explain as well about the route you will be doing. Thank you Sean for organising a flawless tour for our party of 5 people .The itinerary was interesting and all the bookings and transport links worked seamlessly. In addition my thanks to you for responding by return email to any enquiries and confirmation of driver pick up . On the trip our guide Mark and driver Pedro looked after us extremely well and we felt like locals rather than tourists with Baiona and Pontevedra where we discovered the oyster restaurant with the very hospitable patron to be amongst the highlights of our memorable trip . Without hesitation when we are next in Portugal and Spain we would use Sean and his team at EATour Specialist to organise the trip especially if you have a small group of people .